William Thomas “Billy” Doyle passed away on September 28, 2018 at VCU, Richmond, VA. He was born in Bagley’s Mill, VA and was preceded in death by his parents, Willie Elvin Doyle and Mattie Sue Crowder Doyle, a brother, S/Sgt Robert E. Doyle and his father-in-law and mother-in-law, Clifton & Louise Williams. “Billy” is survived by his wife of sixty two years, Anne W, Doyle; two sons, Bill Doyle (Tracy) and Steve Doyle (Jacki); four grandchildren, Colby, Carter, Eli, Luke and step-grandsons Matthew and Jesse Thorpe. Also surviving are two nieces, Peggy Sue Doyle & Elizabeth W. Myers, and two nephews, David Williams (Freda) and Allen Doyle. After graduating from South Hill High School, Billy served in the U S Air Force before entering private life and attending Pharmacy School. He graduated pharmacy school in 1959 and became part owner of Garland Drug, Co, Inc with his partner and friend Armistead G. Lambert. He retired in 2006. 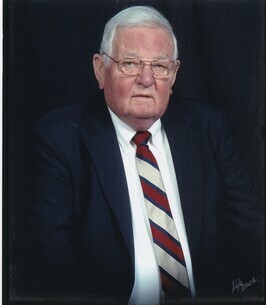 Billy served on the South Hill Town Council for many years, was a director of several bank board’s starting with the Bank of LaCrosse and ending with First Citizens Bank. He was also a member of the American Legion Post 79, South Hill Lodge, 257 A. F, & A. M, South Hill Shrine Club, a member of ACCA Shrine Temple in Richmond and the Scottish Rite of Danville. For more than fifty years, he was a member of South Hill United Methodist Church. Funeral services for Billy will be conducted at 11 AM Tuesday October 2, 2018 at Farrar Funeral Home with interment to follow in Oakwood Cemetery. The family will receive friends Monday evening from 5-7pm at the funeral home. Memorial considerations in Billy’s memory may be to Southside Rescue Squad, P O Box 546, South Hill, VA or South Hill Volunteer Fire Department, 114 Brunswick Ave, South Hill, VA. Farrar Funeral Home of South Hill is serving the Doyle Family. Our thoughts and prayers are with you at this difficult time. So sorry to hear of Billy’s passing. So sorry to hear about Billy passing away. He was such a special man and a joy to everyone that had the pleasure of knowing him. Keeping the family in thoughts and prayers during this difficult time. Our thoughts and prayers are with you during this difficult time. You have our deepest sympathy. To: South Hill Volunteer Fire Dept. Just wanted to let you know that you are in our thoughts and prayers. I was so sorry to hear about Billy. I have wonderful memories of him from when I was a child. All of you are in my thoughts and prayers. I was so sorry to hear of your loss. I remember quite well the Doyle Family who lived across the street from my Grandparents. I also remember Anne Wall since we grew up in the same town. Take care and may God be with you. Our deepest sympathy to all of you in your loss. Billy Doyle was a fine person and was loved by anybody who knew him. He will be greatly missed. May God go with each member of his family in the months ahead without him. Lots of love from our family to yours. Please know that all of you are in my thoughts and prayers...Mr. Doyle was loved by many and will be missed by many...He was a wonderful person..
Anne, so very sorry, God bless you and family.